and a very ornate silver gilt name plaque. The top bar has "W.M. 1930" in silver gilt blue enamel. On top of same we find a Sphinx, which as you will see below was in honour of the Lodge No. 58 of the 50th Regiment. The silver gilt name plaque is extremely fine and comprises of what appears to be a view of the Pyramids at Giza from an Egyptian Temple. Immediately above the columns of the Temple is the Egyptian winged disk emblem, which represents the sun God "Re", identified primarily with the mid-day sun, hence the sun symbol on top of the Temple. The name of the Lodge, "Sphinx Lodge No. 107 I.C. ", in silver gilt blue enamel, surrounds the Temple. The face of the Sphinx is not that of the Sphinx itself and I suspect that it might be a portrait of the Worshipful Master himself! 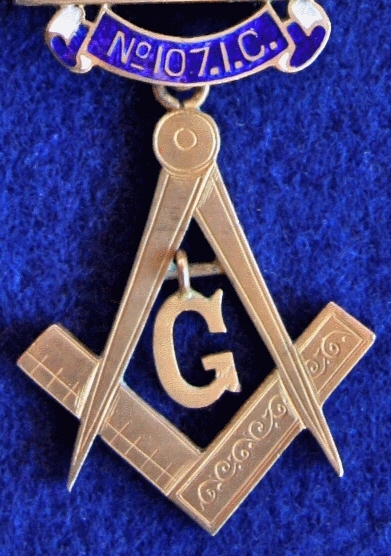 The Compass and Square is a standard Past Master's Jewel with a fixed "G" in silver gilt. The Maker's Mark on the reverse of Jewel is "GK&S". History of Warrant No. 107. Warrant No. 107 originally issued to Brethren in NAVAN, Co. Meath, either in May or July 1739. Warrant No. 107 was cancelled by order of Grand Lodge on 7th October, 1813. Warrant No. 107 was reissued on the 27th November, 1817 to John Peake, Andrew McRoberts and Robert Johnston (all from Lodge 425) to hold a lodge in SAINTFIELD, County Down. Warrant No. 107 was issued in exchange for Warrant No. 425. Warrant No. 107 was cancelled, on 3rd October 1839 but was restored on 5th March 1840, however it was immediately returned and exchanged by the brethren on 11th March 1840 for Warrant No. 35. Warrant No. 107 reissued to brethren in KILRUSH, County Clare on 16th November, 1840. Warrant No. 107 was removed to ENNISTYMON, Co. Clare on the 4th November, 1847. Warrant No. 107 was cancelled on 5th July 1856. History of Sphinx Lodge No. 107 1861 - to date. "6 February, 1861 – Read a Memorial for a Warrant to hold a Lodge at Colombo, Ceylon, recommended by Lodges No. 58 H.M. 50th Regt. Read application for a Dispensation to allow Dedication of same. Read Bye-Laws submitted for government of same. The Board recommend that a Warrant (to be numbered 107) be granted, that a Dispensation be granted for the Dedication and that the Bye-Laws be approved of." The Recommendation of The Board was followed, as is shown in the Grand Lodge Minutes of 7th February 1861 as "Agreed to." Warrant No. 107 reissued to Brethren in COLOMBO, Sri Lanka on 16th February 1861 - the Lodge to known as "Sphinx Lodge". Arthur Hansbrow; Henry Thompson and Charles H. Newton, together with two other brethren, all from Lodge No. 58, registered on the 16th February, 1861. W. Brother Richard Waddy [665 E.C.] presided at the Installation of the first Worshipful Master of Sphinx Lodge, W. Brother Arthur Hanbrow, which took place on the occasion of the Dedication. A further four brethren again from Lodge No. 58 registered on various dates up to 23 April, 1861. The reason for that the Foundation Members of Sphinx Lodge No. 107 were all members of "The Queen's Own" Lodge No. 58 was because they were Civilian Members of Lodge No. 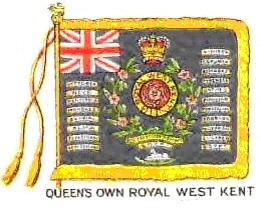 58, a Military Lodge, attached to The 50th (Queens Own Royal West Kent) Regment , who were left behind in Columbo when the 50th Regiment left for Kandy. 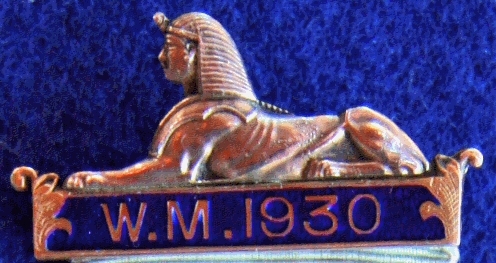 The name "Sphinx" was given to the Lodge No. 107 as a token of esteem and regard for "the Queen's Own" Lodge No. 58, from whence the Sphinx Lodge emanated, and in compliment to the 50th Regiment, which greatly distinguished itself in Egypt, and bears the Sphinx as the leading badge on the colours of the Regiment. A total of 360 brethren registered up to 22nd April, 1895. In most cased the dates when the degrees were conferred and the issue of certificates is shown. A total of 65 brethren registered up to 23rd July, 1900. In most cases the dates when the issue of certificates is shown. "4 February, 1901 – Read letter from Lodge 107 Colombo, Ceylon for leave to change its place of meeting to a new Hall built in Colombo. Granted." 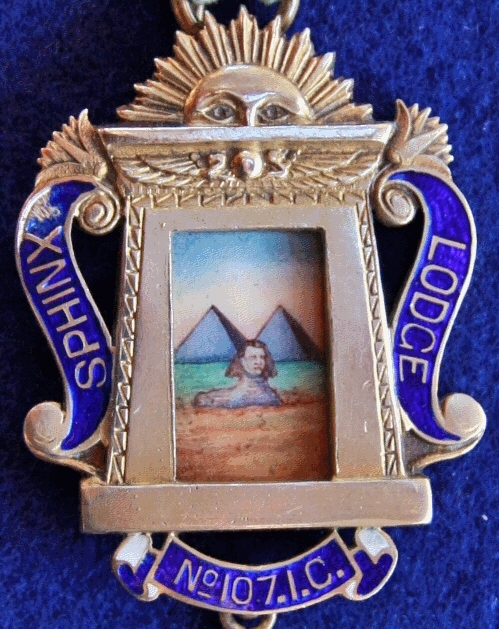 On 2nd July, 1906 Sphinx Lodge No. 107 wrote to Grand Lodge Board in respect to the proper mode of working under the I.C. The Board directed the D.G.S. to inform the Lodge that G.L. requires all Lodges under its jurisdiction to conform to Irish working. That Grand Lodge cannot directly or indirectly take cognisance of any printed or written ritual purporting to convey Irish working and prohibits the compilation or use of any such ritual. That the Grand Secty. Of Instruction be requested to communicate with the Lodge and brethren concerned specifying the reasons which govern G.L. in giving this decision. Fifty-two members served in the 1914 -18 War and Bro. Lieut. B.A. Horsfall VC [see below] East Lancashire Regt. made the supreme sacrifice. A total of 260 brethren registered up to 24th September, 1923. In most cases the dates when the issue of certificates is shown, together with the occupation of the brother. "Warrant No. 107 to Colombo, Ceylon as “Sphinx Lodge” and the Register commences with the registration of Robert H. Crichton, Dispenser on affiliation from Lodge No. 443 SC, registered 7 July, 1924"
A total of 181 brethren registered up to 16th November, 1954. In most cases the dates when the issue of certificates is shown, together with the occupation of the brother. Many of the brethren registered were in the armed forces and their ranks are shown. "21 September, 1960 – The Board granted permission for Lodge No. 107 to have a silver Collar for the Worshipful Master in the Lodge Centenary year, 1961, on the same pattern as the Collar of Lodge No. 245." The Lodge Centenary was celebrated on Saturday, 22nd April 1961 at 6.15 p. m. in the Victoria Masonic Temple, Galle Face, Colombo. From 1984 the registration of members of SPHINX LODGE NO. 107 is held, in alphabetical order, in a computerised register by Grand Lodge, Freemasons’ Hall, 17 Molesworth Street, Dublin 2. The Registration of the Worshipful Master, Wardens and Secretary of Lodges are held in separate Registers, the first Volume covering the period 1983 to 1994 inclusive and the second Volume covering from 1995 to date. Papers by R.W.Bro. Jacques Huyghebaert. & History of Irish Freemasonry in Sri Lanka. Sketch of Irish Freemasonry in Sri Lanka. A Member of Sphinx Lodge No. 107 and Recipient of The Victoria Cross. Bro. 2nd Lieut. B.A.Horsfall, V.C. Basil Arthur Horsfall was born in Ceylon on 4th October, 1887. He was a Member of Sphinx Lodge No. 107 having been Intiated on the 19th April ,1915, Passed on the 18th June, 1915 and Raised on the 25th October, 1915. He was an Accountant prior to joining and receiving his Commission in the East Lancashire Regiment in December 1916. 2nd Lieut. Horsfall was posthumously awarded the Victoria Cross for most conspicuous bravery and devotion to duty whilst attached to the 11th Battalion at Ayette, France on 27th March, 1918. 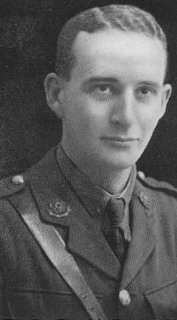 "On 27th March 1918 between Moyenville and Ablainzeville, France, when the enemy first attacked Second Lieutenant Horsfall's centre platoon, his three forward sections were driven back and he was wounded in the head. Nevertheless he immediately reorganised the remainder of his men and made a counter-attack, which recovered his original position. Despite the severity of his wound, he refused to go to the dressing station, as the three remaining officers in his company were casualties. Later, he made a second successful counter-attack but when finally ordered to withdraw, he was the last to leave the position. He was killed almost immediately afterwards." 2/Lt. Horsfall Died on 27th March, 1918 near Ablainzeville, France. (Killed in action) and has no known grave and is commemorated on the Arras Memorial. Details of when Sphinx Lodge No. 107 meets. Sphinx Lodge No. 107 meets on the 4th Mon. at 6.30p.m. (Except 12) at Victoria Masonic Temple. Galle Face, Colombo, Sri Lanka.